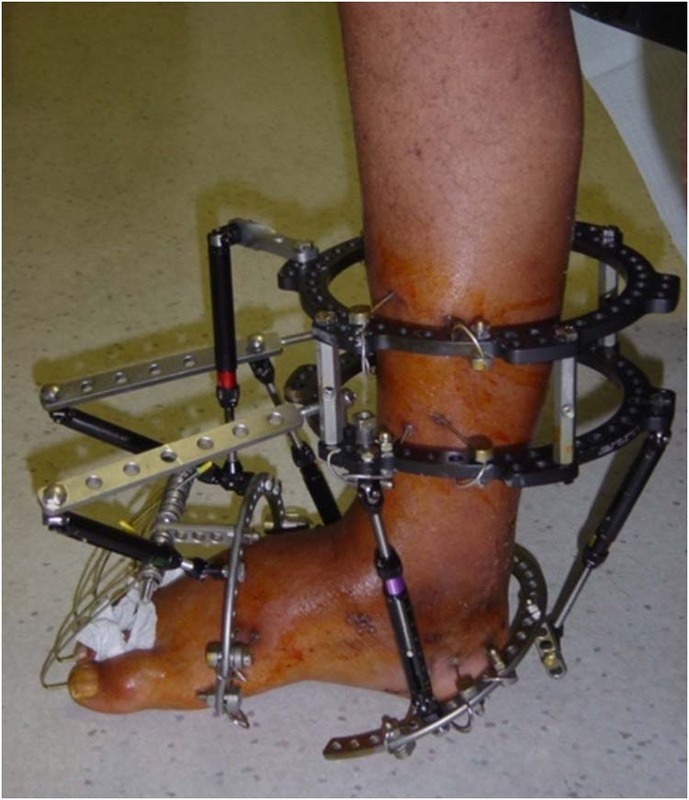 An 84 year-old male with a full-thickness Achilles ulcer for 4 months was successfully healed with split-thickness skin grafting after application of an external ring fixator as an offloading and immobilizing tool. This method allowed for weight-bearing during treatment. The use of external fixation devices for soft tissue reconstruction of the lower extremity can be a useful adjunct. Management of posterior ankle wounds involving the Achilles tendon pose a reconstructive challenge due to of the paucity of soft tissue surrounding the ankle. [1,2] It is often anecdotally thought that the perfusion in the region overlying the Achilles tendon is poor, resulting in healing delays. However, the source of blood supply to the skin has been well delineated by Ian Taylor, a plastic surgeon in Michigan, who has published much work on angiosomes and musculocutaneous/fasciocutaneous perforators, which supply the subdermal plexus and capillary network. Perhaps, it might be said that the cushion effect of the subcutaneous tissue being absent overlying the Achilles renders the perforators more susceptible to injury. This results in relatively poor regenerative capacity when injured. To avert these challenges, wounds with exposed Achilles tendon have been treated with autologous keratinocytes,  frozen epidermal allograft,  and free flaps. 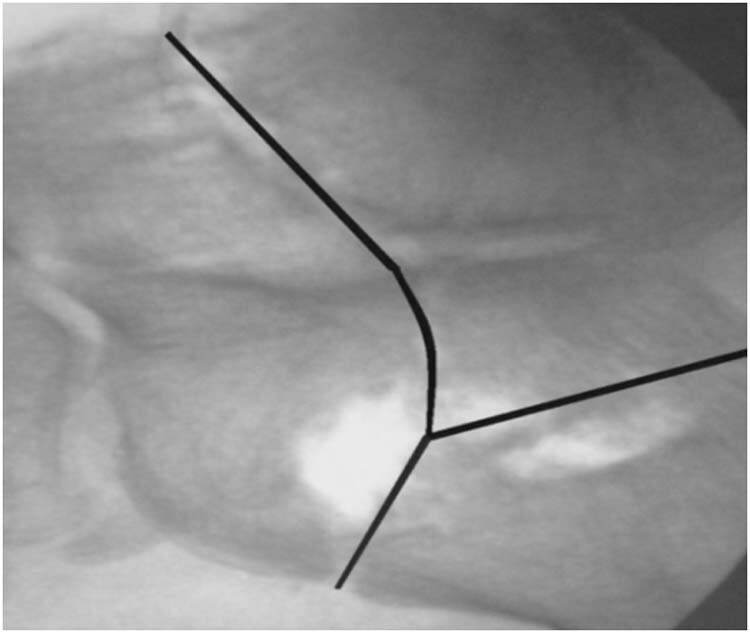 Traditionally, there has been reluctance in using split-thickness skin grafts (STSG) on the Achilles tendon and past treatment involved the use local, pedicle, or free flaps. Recently, Attinger et al, demonstrated that with a properly prepared wound bed, skin grafting is as effective as local or free flaps in healing Achilles tendon wounds. 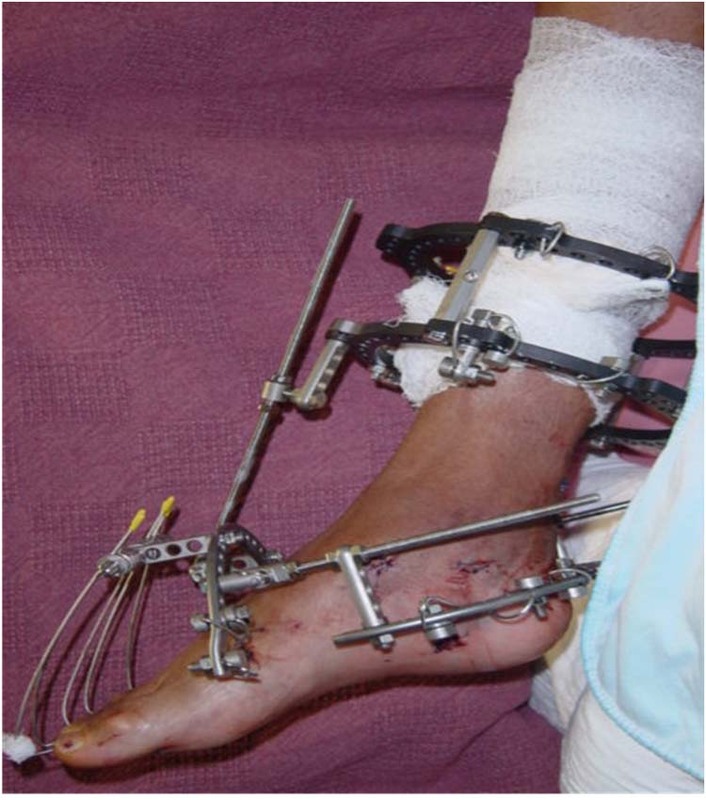 The requirement for offloading and immobilization is paramount in these wounds with exposed Achilles tendon and is achieved with casting or windowed total contact casting. We present a method to achieve these goals utilizing external ring fixation allowing weight-bearing during treatment. 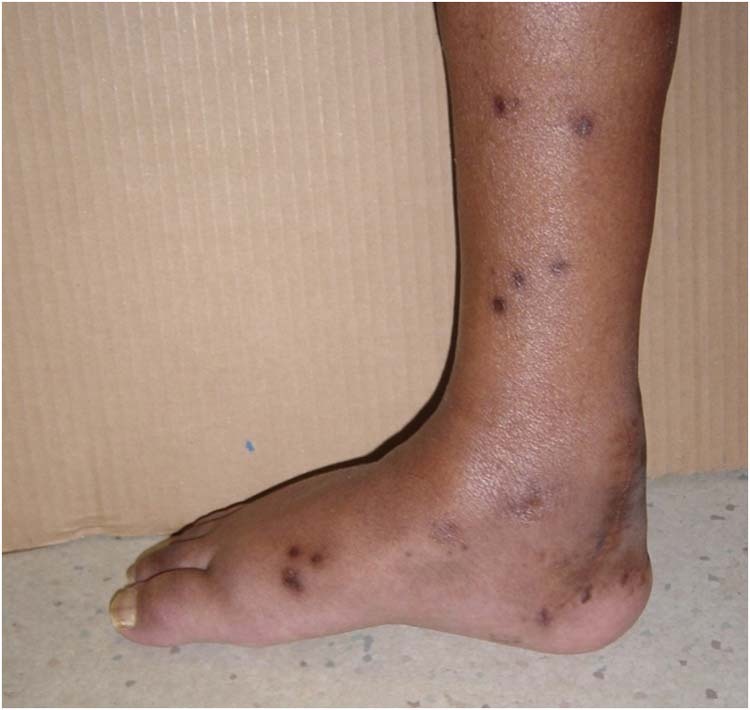 Figure 1 Full-thickness necrotic ulcer with exposed Achilles tendon. 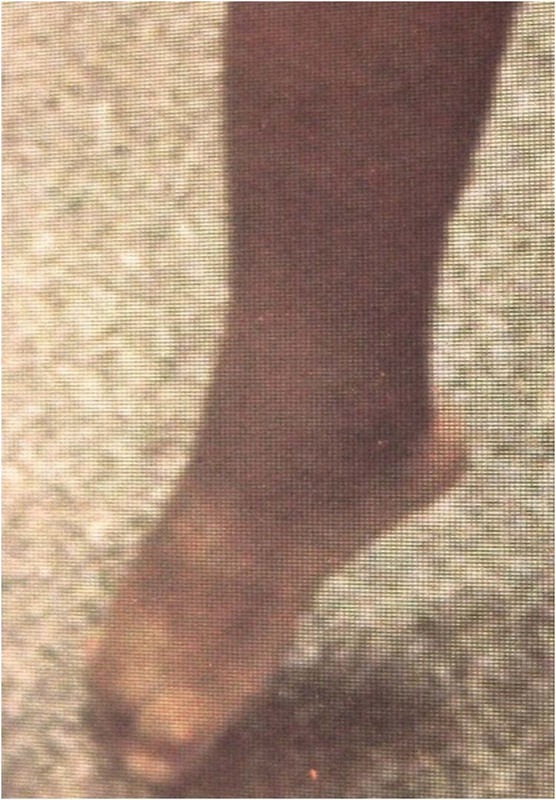 With ankle motion, the tendon could be seen sliding in and out of the intact paratenon. The periwound area was fibrotic with patches of necrotic tissue. Erythema extended for 2 cm around the wound but no purulence was present. Noninvasive vascular studies revealed an ABI of 0.94 on the ulcerated extremity. After a 5 day hospital admission for treatment of cellulitis with parenteral antibiotics, the patient underwent surgical debridement of the tendon and application of an external fixator. 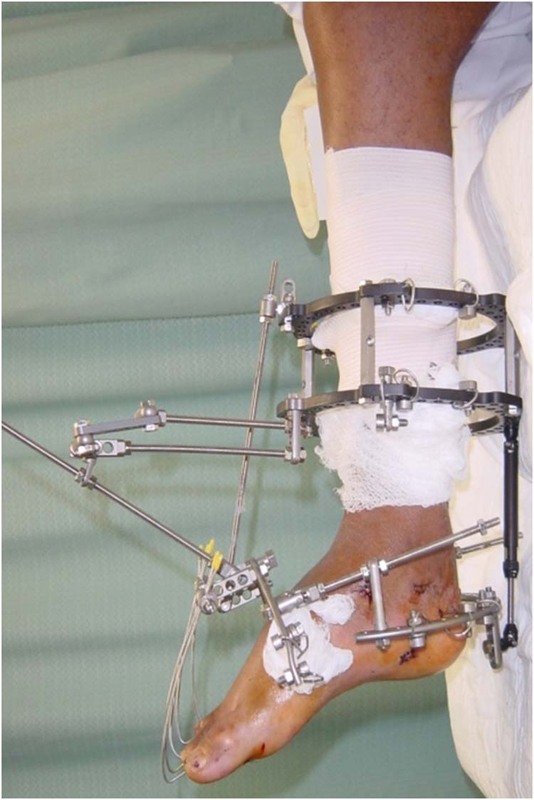 Figure 2 External ring fixator in place with a post-operative shoe drill-mounted into the tibial ring for ambulation. The patient was admitted to a short-term rehabilitation center. After 15 days, the patient was brought back to the operating room for a repeat debridement and Apligraf placement under the Wound V.A.C. ® Twenty days passed until the granulation tissue thoroughly formed over the tendon. At this time, the patient returned to the OR for application of a STSG donated from his ipsilateral thigh. The STSG was secured with staples and the Wound V.A.C. ® was replaced for 4 days. After 28 days approximately 50% of the graft had incorporated. (Fig 3) The decision was made to harvest a second STSG and apply it to the remaining wound. Within the next 4 weeks the wound had completely epithelialized. Figure 3 Twenty-eight days after application of a split-thickness skin graft showing 50 percent graft incorporation. The patient remained active and was allowed to bear weight and ambulate throughout treatment. The external fixator was removed after 90 days of use. The patient remained in the rehabilitation center for 2 weeks after removal of the fixator, then discharged home. At 10 months the patient remained fully healed and an active ambulatory community. 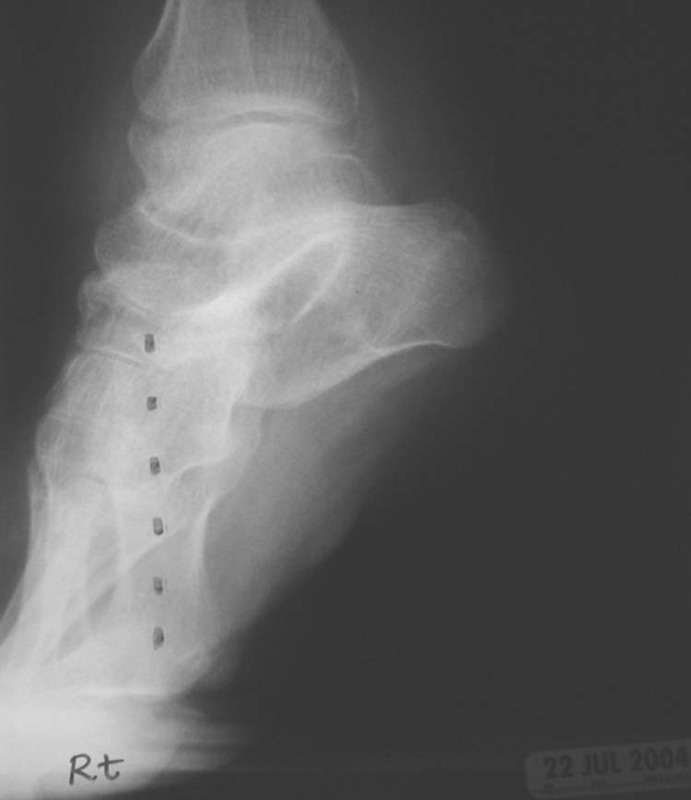 (Fig 4) Eleven months after the post external fixation was removed, the patient developed a superficial blister to the posterior ankle. The area was examined closely and appeared to be free of infection. He was sent home with topical becaplermin gel and a walking Multipodos®. The wound healed uneventfully after 3 weeks and the patient successfully returned to his previous lifestyle. Figure 4 The ulcer over the Achilles tendon is completely healed. The graft site is shown here at 10 months after removal of external fixator. Noack, et al, described the use of external fixation after a reverse flow sural artery flap to provide strict immobilization of the affected leg. 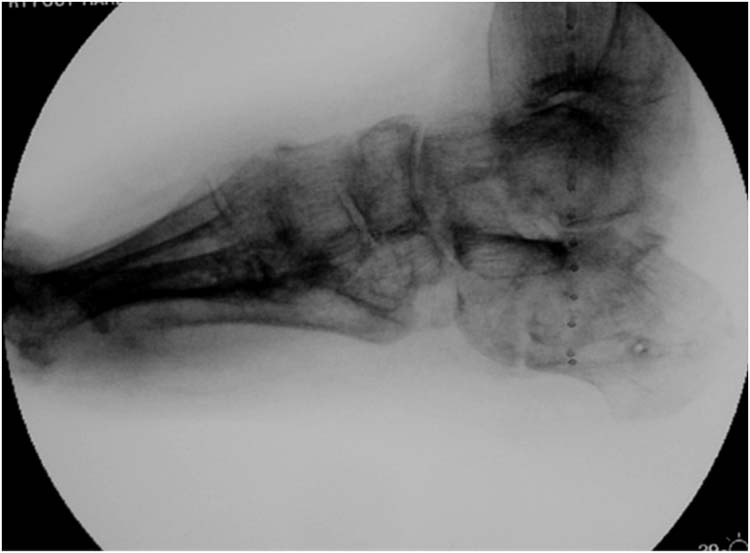 Roukis, et al, has used it for pressure relief after soft tissue reconstruction of heel defects. Specifically in the Achilles tendon, external fixation has been used to offload the tendon repair and may lead to a lower re-rupture rate. [14,15,16] The external fixator in our case served several purposes: It elevated and offloaded the posterior ankle, allowed for daily inspection of the wound, immobilized the ankle and Achilles tendon, and more importantly, it allowed the patient to ambulate during treatment. In this example, negative pressure wound therapy (NPWT) was initiated to enhance granulation tissue and ease the transition to wound closure. The Wound V.A.C.® device was also used as a bolster dressing after applying the bilayer skin replacement and meshed STSG. Although difficult, the external fixation device allowed us to combine NPWT with our immobilization, which could not be accomplished in a cast. External ring fixation may prove a useful tool in difficult to heal wounds involving the Achilles region. 1. Leung PC, Hung LK, Leung KS. Use of the medial plantar flap in soft tissue replacement around the heel region. Foot Ankle 8(6):327-330, Jun 1988. 2. Yilmaz M, Karatas O, Barutcu A. The distally based superficial sural artery island flap: clinical experiences and modifications. Plast Reconstr Surg. 102(7):2358-2367, Dec 1998. 3. Dalla Paola L, Cogo A, Deanesi W, Stocchiero C, Colletta VC. Using hyaluronic acid derivatives and cultured autologous fibroblasts and keratinocytes in a lower limb wound in a patient with diabetes: a case report. Ostomy Wound Manage. 48(9):46-49, Sep 2002. 4. Bolivar-Flores YJ, Kuri-Harcuch W. Frozen allogeneic human epidermal cultured sheets for the cure of complicated leg ulcers. Dermatol Surg. 25(8):610-617, Aug 1999. 5. Hallock GG. Free-flap coverage of the exposed Achilles tendon. Plast Reconstr Surg. 83(4):710-716, Apr 1989. 6. Attinger CE, Ducic I, Hess CL, Basil A, Abbruzzesse M, Cooper P. Outcome of skin graft versus flap surgery in the salvage of the exposed achilles tendon in diabetics versus nondiabetics. Plast Reconstr Surg. 117(7):2460-2467, Jun 2006. 7. Caputo GM, Cavanagh PR, Ulbrecht JS, Gibbons GW, Karchmer AW. Assessment and management of foot disease in patients with diabetes [see comments]. N Engl J Med. 331(13):854-860, 1994. 8. 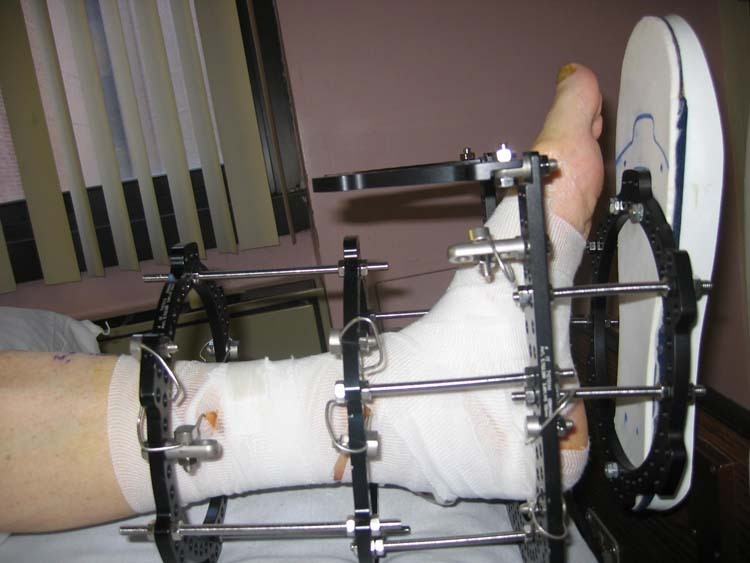 Roukis TS, Zgonis T. Postoperative shoe modifications for weightbearing with the Ilizarov External Fixation System. J Foot Ankle Surg. 43(6):433-435, Nov-Dec 2004. 9. Gugenheim JJ, Jr. The Ilizarov method. Orthopedic and soft tissue applications. Clin Plast Surg. 25(4):567-578, Oct 1998. 10. Tsuchiya H, Sakurakichi K, Uehara K, Yamashiro T, Tomita K. Gradual closed correction of equinus contracture using the Ilizarov apparatus. J Orthop Sci. 8(6):802-806, 2003. 11. Bar-Meir E, Yaffe B, Winkler E, Sher N, Berenstein M, Schindler A. 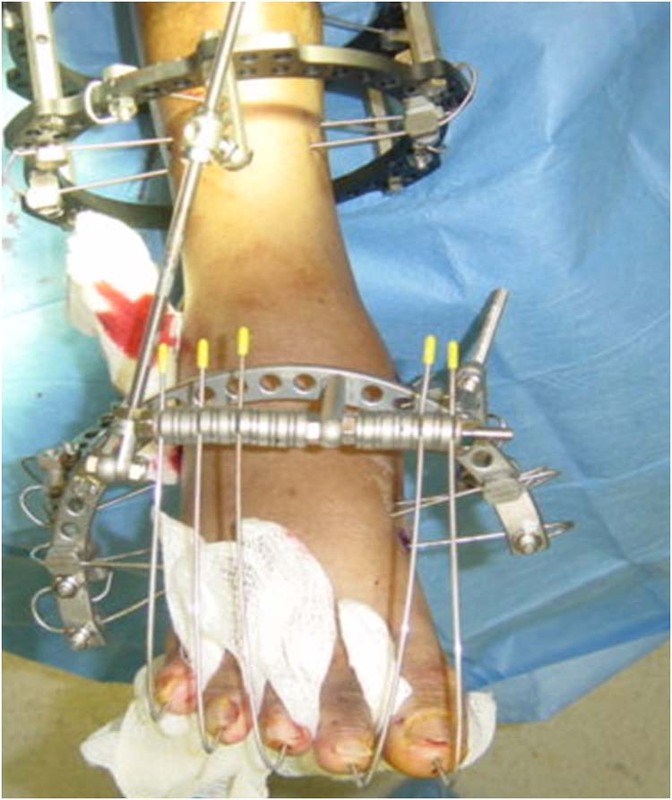 Combined Iliazarov and free flap for severe recurrent flexion-contracture release. J Burn Care Res. 27(4):529-534, Jul-Aug 2006. 12. Noack N, Hartmann B, Kuntscher MV. Measures to prevent complications of distally based neurovascular sural flaps. Ann Plast Surg. 57(1):37-40, Jul 2006. 13. 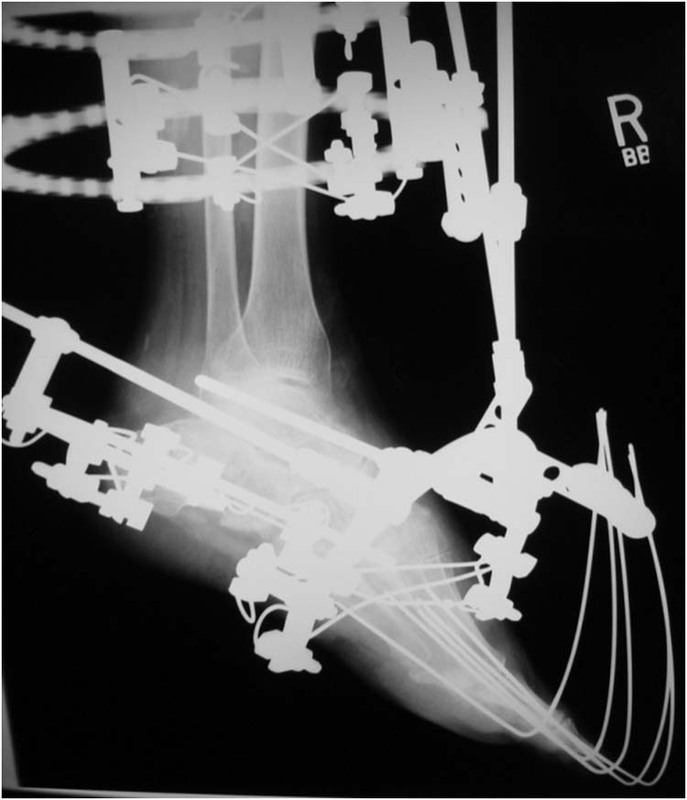 Roukis TS, Landsman AS, Weinberg SA, Leone E. Use of a hybrid “kickstand” external fixator for pressure relief after soft-tissue reconstruction of heel defects. J Foot Ankle Surg. 42(4):240-243, Jul-Aug 2003. 14. Shea KG, Showalter L. Ilizarov method of repair of achilles tendon rupture in a patient with congenital insensitivity to pain. A case report. J Bone Joint Surg Am. 85-A(9):1816-1818, Sep 2003. 15. Casteleyn PP, Opdecam P, De Clercq D. Surgical treatment of Achilles tendon ruptures, combined with an external fixation system. Acta Orthop Belg. 46(3):310-313, May-Jun 1980. 16. Wong J, Barrass V, Maffulli N. Quantitative review of operative and nonoperative management of achilles tendon ruptures. Am J Sports Med. 30(4):565-575, Jul-Aug 2002. 1,2Amputation Prevention Center, Broadlawns Medical Center, 1801 Hickman Road, Des Moines, IA 50314. 3Chief; Plastic Surgery Section. Caritas Health Care, Inc. (formerly; Saint Vincent Catholic Medical Centers) St. John’s Hospital, 90-02 Queens Boulevard, Elmhurst, NY 11372. 4Assistant Program Director; PM&S 24 and PM&S 36 Residency Programs. Caritas Health Care, Inc. (formerly; Saint Vincent Catholic Medical Centers) St. John’s Queens Hospital, 90-02 Queens Boulevard; Elmhurst, NY 11372.